The division commanders at Kelly Field become alarmed at the intense sound of fighting at Horseshoe Ridge. They agree, because General Thomas is at Snodgrass Hill and left no single commander in charge at Kelly Field, to send a brigade to help. Hazen’s brigade pulls out of line. The timing of the march is probably not exact. 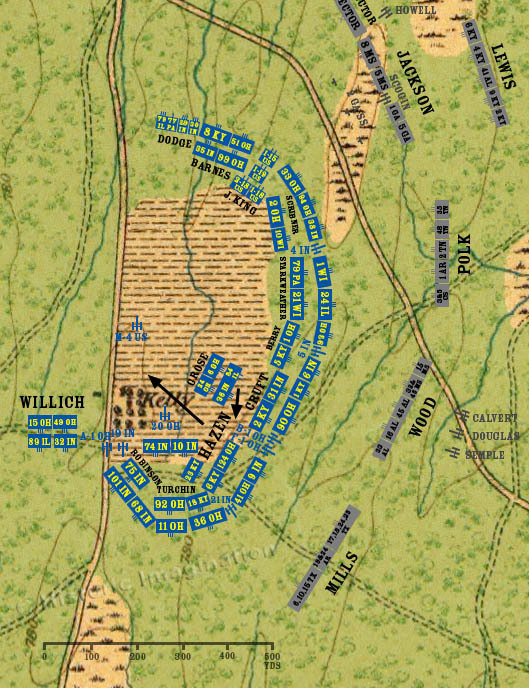 In the confusion, it takes about an hour to march the short distance to Snodgrass Hill, even losing men along the way due to Confederate skirmishers.